Sci-Fi, Shakespeare, & Rock ‘n’ Roll all in one place! 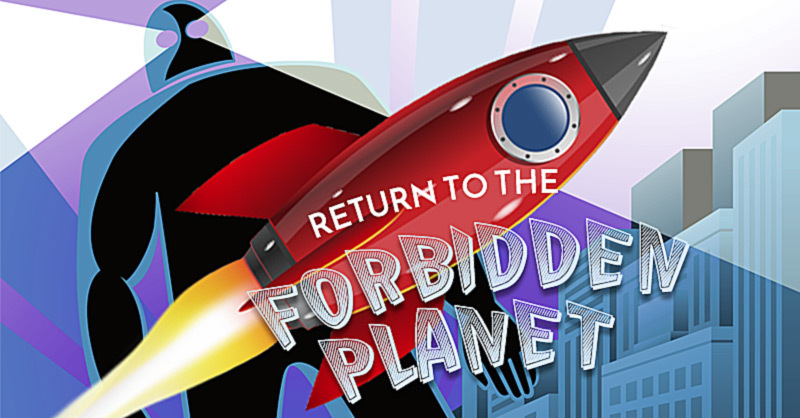 Written by Bob Carlton, “Return to the Forbidden Planet” is inspired by Shakespeare’s “The Tempest.” This jukebox musical is packed with rock ‘n’ roll classics such as Heard it Through the Grapevine, Young Girl, Good Vibrations, and Gloria. Fasten your seatbelts, return your tray tables to the upright position, and prepare to blast off! In this Olivier-award-winning musical, the many works of Shakespeare are aligned with a fabulous rock ‘n’ roll score to create a fun-filled, jiving-in-the-aisles musical. Loosely based on Shakespeare’s The Tempest and the 1956 sci-fi classic film Forbidden Planet, Return to the Forbidden Planet finds a spaceship, helmed by Captain Tempest making an emergency landing on the uncharted planet D’Illyria. The only residents there are the mad scientist Doctor Prospero, his daughter Miranda, and their robot Ariel. They were banished into hyperspace when Miranda was just a baby. She has known no other world than this. Featuring rock n’ roll hits of the 50s and 60s, a B-movie atmosphere, and dialogue in iambic pentameter, Return to the Forbidden Planet is Shakespeare’s unwritten rock ‘n’ roll masterpiece. Throw in a roller-skating robot, unrequited love, and a scary space monster, and you’ve got one groovy show! “Return to the Forbidden Planet” is presented by special arrangement with Samuel French. This entry was posted	on Thursday, February 8th, 2018 at 4:20 pm	and is filed under News & Blog, Past Community Theater Shows. You can follow any responses to this entry through the RSS 2.0 feed. Both comments and pings are currently closed.